About the Author: Jonathan Wilson is a Ph.D. student in American intellectual history at Syracuse University. An earlier version of this article was posted in November at The Junto: A Group Blog in Early American History. It is reprinted in a modified version here with permission. Late last year, Doug Phillips, the president of Vision Forum Ministries, publicly admitted to an inappropriate extramarital relationship and resigned. Shortly afterward, the Vision Forum board of directors decided to shut down the San Antonio ministry. In the months since then, World Magazine has reported additional terrible details about Phillips’s alleged behavior toward a woman under his care. The story made even secular news. For years, Vision Forum and Doug Phillips had enjoyed oversized influence in homeschooling circles as leaders of the “Quiverfull” movement, encouraging Christians to have (and homeschool) large families as a way of exercising influence in the world. To be fair, Vision Forum’s view originated in a specific theological tradition to which most members of the “Religious Right” probably do not belong. And it leads to some conclusions that many Christian conservatives find repellent. Yet some of Vision Forum’s teachings have been disproportionately influential in the American homeschooling movement. And they are especially important for understanding the movement’s relationship to the painful history of American racism. What sorts of conclusions did Vision Forum draw from its theology? First, there are the obvious ones. Vision Forum also sold homeschooling families highly gender-specific toys like an “all-American boy’s crossbow” and a “Princess Virginia” dress meant to encourage a girl as she “identifies with Mommy and experiences how unique and wonderful it is to be a girl, to be a daughter of the Most High King—to be His little princess!” Vision Forum’s entire merchandise catalog encouraged as much differentiation as possible between boy leaders and girl followers. Interestingly, there was also a pronounced nationalistic dimension to gender in this catalog. Vision Forum boys and girls were always American boys and girls. Although many evangelical bloggers and journalists have been highly critical of Vision Forum’s attitudes toward gender, they have often overlooked this. Vision Forum promoted American nationalism on the basis of their brand of Calvinist covenant theology, which implied that an authoritarian family structure would regenerate God’s special covenant with the United States of America. 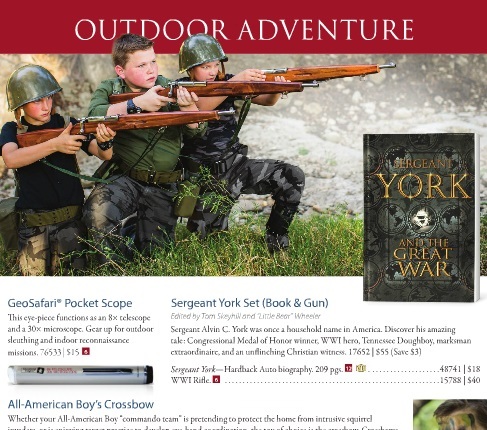 Yet militant identification with the United States—and especially with its early history—is evident everywhere in Vision Forum’s catalog, especially in its merchandise for boys. Even more important, however, is that Vision Forum promoted a vision not just of male leadership in the family and the nation, but more specifically a vision rooted in an ideology of white male mastery. And it promoted not just American nationalism, but Southern nationalism—the nationalism of the Confederacy. To be clear, Vision Forum was not an avowedly racist organization. It did not directly or consciously advocate white supremacy. But it did deliberately promote nostalgia for the white supremacist social order of the Old South. In fact, one of Doug Phillips’s first books, published in 2003, was a short edited collection of writings by Robert Lewis Dabney, a Southern Presbyterian theologian. Its subtitle is The Prophet Speaks. Dabney, though technically an opponent of secession, was an enthusiastic defender of southern slavery. He served in the Confederate army as a chaplain and as an aide to Stonewall Jackson, and after the war, he published A Defence of Virginia, and through Her, of the South. This book defended human slavery, endorsing the notion that God instituted black slavery through the “curse upon Canaan” after Noah’s flood. Dabney also published an admiring Life of General Jackson and later a pamphlet denouncing racial integration in Presbyterian churches. None of this meant that Doug Phillips consciously endorsed white supremacy. In his collection, instead, Phillips printed excerpts of Dabney’s later diatribes against public education and feminism. Yet Phillips was clearly enamored of Dabney as a person and as a cultural figure. Meanwhile, Vision Forum sold various history books and audio albums that discussed the Civil War itself. 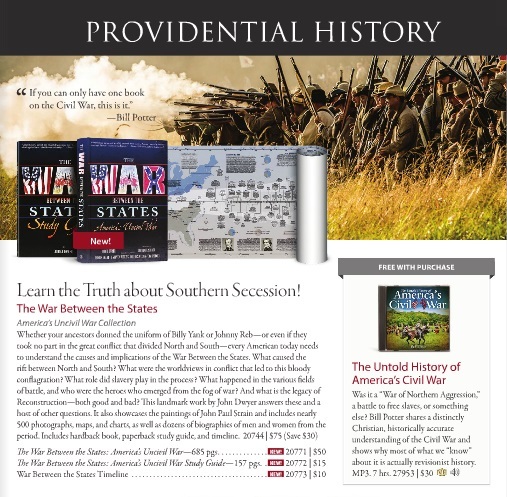 The online descriptions were vague, but these materials had the usual earmarks of what historians call the “Lost Cause” interpretation of the war—the discredited claim that secession was not about slavery, that the North was oppressive, and that most African Americans actually preferred to be slaves. As an American historian, I can say with confidence that Vision Forum was wrong about this. In the 1860s, Confederate leaders said without any hesitation that their goal was to protect slavery. Confederate leaders talked a lot about how the federal government was supposedly taking away their rights. But the key right they had in mind, according to their own words, was the right to own black people. They insisted that white men had this right not only in their own states but also in free states and territories, even if the whites there objected. To protect this “right,” they not only decided to leave America but also deliberately fired on a U.S. military post. In the American Civil War, the Confederacy formed to defend slavery, and then it fired the first shot. But Vision Forum’s pro-Confederate position probably shouldn’t be surprising, given Vision Forum’s close resemblance to (and relationship with) the better-known ministry of Idaho pastor Douglas Wilson. Douglas Wilson, an unbelievably prolific writer, may be the best-known advocate today of a conservative Calvinist vision for patriarchal family life and gender roles. He is still quite influential in the homeschool movement. He’s also notorious for writing two books on slavery, Southern Slavery: As It Was and Black & Tan, both of which are available online. These two books about the Old South include condemnations of racism. But they deny that slavery is wrong. “Was slave ownership malum in se, an evil in itself?” Wilson asks at one point in Black & Tan. “The answer to that question, for anyone who believes the Bible, is that it was possible for a godly man to own slaves, provided he treated them exactly as the Scripture required.” Wilson also calls proslavery theologian Robert Lewis Dabney a “virtually prophetic” man, just as Doug Phillips did. Wilson acknowledges and condemns Dabney’s racism, but he apparently has almost nothing to say about Dabney’s views on slavery itself. All of this leaves us with an important question. Why would Christian homeschooling advocates who claim not to be racist promote this kind of nostalgia for the antebellum South? Why would they encourage us to idolize the Old South’s slavery-based plantation culture, its slaveowning white men, and its self-serving views about the federal government? Oddly enough, it seems fairly clear that racism isn’t the place to start. Although fondness for the antebellum South often does result from racism, I don’t think it would be helpful to assume that’s the key reason for Vision Forum’s views. There is little direct evidence that Vision Forum was consciously racist, and there’s quite a bit of evidence that they didn’t want to be racists. If nothing else, blaming racism is the least interesting thing we could say about what was going on in their ministry. But we need to recognize that in real-life America, slavery is inextricable from racism, and so is the history of the Confederacy. 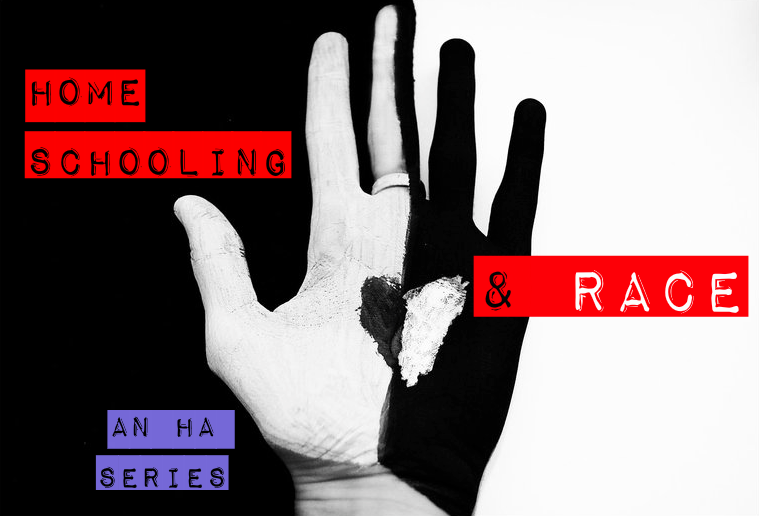 The association between slavery and racism isn’t accidental or irrelevant. When you claim the right to own an entire category of people as slaves, you cannot see them as equal human beings. And we also need to see that Vision Forum’s nostalgia for a white slaveowning society was directly related to its nostalgia for an authoritarian code of sexual ethics. The right to own slaves may not have been the point of Vision Forum’s preaching, but the nearly absolute authority of the male householder, commanding all other members of the family, certainly was. No amount of talk about “complementary” roles for men and women can conceal what Vision Forum was actually eager to announce: that its key concern was patriarchy—a system of governance, not just a distribution of responsibilities. From that perspective, the Old South represented a convenient image of white manhood and womanhood. To Vision Forum, the Confederacy’s fate served as perhaps a hint of why authoritarian manhood seems endangered today. In addition, the failure of the Confederacy may be a convenient explanation for the supposed decline of Christian civilization in what Vision Forum claims was a providentially founded Christian nation. For them, the Civil War can serve as the moment when God chastised his people in America (just as he did the ancient Hebrews) for straying from their appointed course. It also seems to represent what can happen when a society fails to cohere—when its authority structures, and thus its values, fail. It explains what went wrong in God’s own nation. We need to recognize that this authoritarianism is a vision of slavery and death. We can empathize with people who yearn for a lost culture. We can try to understand their anxiety and alleviate their fears. But we must call their vision what it is and offer another way. Here’s Wilson’s comment in fuller context: “The issue is whether a Christian man could have lawfully owned a slave in 1850 America without being necessarilyguilty of a moral outrage. Was slave ownership malum in se, an evil in itself? The answer to that question, for anyone who believes the Bible, is that it was possible for a godly man to own slaves, provided he treated them exactly as the Scripture required. In a sinful world, slave ownership generallyis sinful, and it is a system that invites abuse. Over time the gospel will overthrow all forms of slavery. But again, the kingdom arrives like yeast working through the loaf, and not like a coup de main. In the meantime, to have the likes of the abolitionist Charles G. Finney (who said that it is impossible to be on the right side of God and the wrong side of the slavery issue) hurling his taunts at Abraham and Philemon is a bit thick.” Douglas Wilson, Black & Tan: A Collection of Essays and Excursions on Slavery, Culture War, and Scripture in America(Moscow, Idaho: Canon Press, 2005), 69. For Wilson’s remarks about Dabney, see pp. 79-94. While I do not agree with many of the positions that Vision Forum held to, I do believe in the honest representation of those we might disagree with, and I believe that this article exaggerates several key points in order to paint the company as definitely racist. First, the names of the two white dolls you mentioned that Vision Forum sold were the same names as two of Doug Phillips’ daughters. 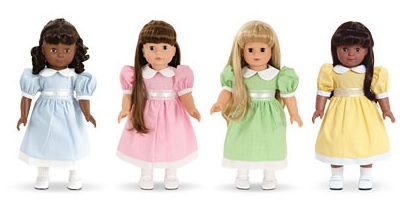 Therefore, it is unfair to automatically assume that the set of dolls were named to reflect their positions in society. An equally likely explanation is that two dolls were named after his daughters and two were given other names. The name Abigail, though common, still has meaning–father’s joy–and the name Fidelia is a beautiful old fashioned name that reflects a virtue we should all show towards others. Rather than these names being distinctly different from the others, they instead reflect a consistent pattern with Phillips’ selection of names. Secondly, as a student of history myself, I know that history is very subjective to the individual experiences of each person and is typically far more complex than our history books paint it. To say that the protection of slavery was the cause of the war is a gross oversimplification. Having studied the Civil War under one of the greatest Civil War historians in the country, I learned that there were many factors that contributed to the Civil War, as with any war. And this position makes far more logical sense than the claim that a single primary factor–slavery–turned even families against each other as it split the country in two. The fact that the Emancipation Proclamation freed only the slaves that Lincoln had no authority to actually free further supports the idea that slavery was not the sole cause of the war. If it was, slavery should have ended in the North before it was figuratively abolished in the South. The fact that Vision Forum held to this view rather than your personal view does not make them racist. Was Vision Forum racist? Perhaps. But this article does not accurately support that claim. The article does not claim that Vision Forum was deliberately and blatantly racist. So it is not surprising that you concluded that the article does not prove that Vision Forum was racist. The article does not even attempt that claim. This article points out that groups, such as Vision Forum, with various notions of providentialism, patriarchy, and dominionism are in the end, quite focused on authority. They are concerned with earthly authority. And perhaps most importantly, they are concerned with the authority of Christian men to run their families and our government as they deem wise. According to this article, that is why Vision Forum and similar homeschool groups tend to romanticize the Old South. They like the image of men being in charge and having other human beings subservient to them. Again, DABNEY as in Stonewall Jackson’s aide who was considered a rabid racist even by 19th Century Confederate standards? Yet Phillips was clearly enamored of Dabney as a person and as a cultural figure. This is the same Phillips who cosplayed as an 18th Century Highborn Nobleman and General Patton and insists on using his quasi-noble title of ESQUIRE whenever possible. Who got in a scandal for sexually abusing his Commander’s Handmaid with plausible deniability thrown in (“I did not Know her in a Biblical way”). 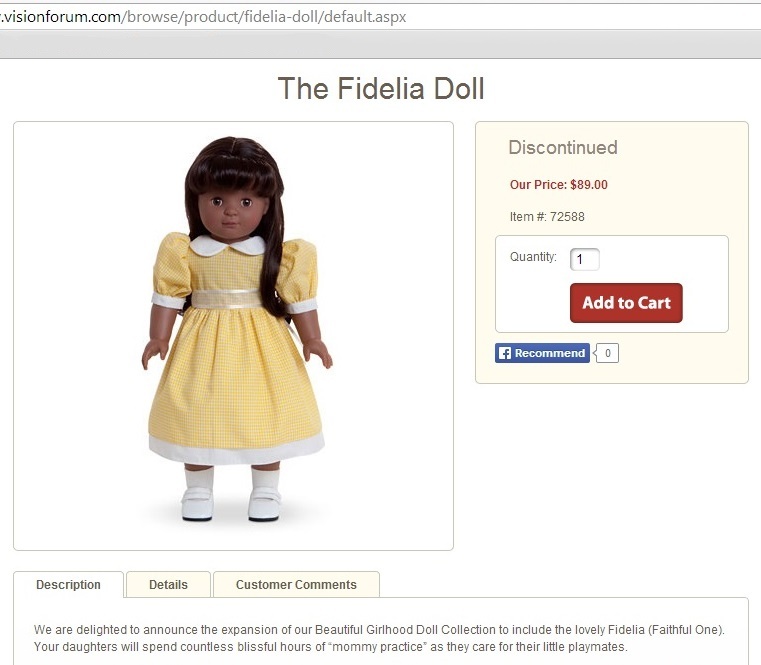 I’m positive the Fidelia doll is supposed to be Latina and 90% sure it’s modeled on Lourdes Torres. The War of Northern Agression is the proper name for the 1861-1865 war between north and south. It was not fought over slavery either. It was fought because of federal taxation of the South with the proceeds going to northern railroaders. The Southern exports of cotton were taxed through duties, imposts, and excise, to the hilt. The North exported nothing but the North got to spend the gold and silver expropriated from the South. That would probably bug you too, if it was your money that was being redistributed against your will (what is welfare? social security? medicare? and the rest of the socialist schemes). You might well seceed from such a lop-sided “union” given the opportunity. Also, Lincoln was a bought-and-paid-for railroad man. When he was ushered into the federal presidency, the South had nothing good to look forward to. Just a little testament to the true character of Lincoln and his henchmen, had they not won the war, they would have been hanged for their murderous war crimes against civilians. Sherman was a first rate demon with an army of immoral thugs and he had the full approval of Lincoln for every atrocity he ordered his army of willing Yankees to commit. As for slaves, the 14th amendment created a new class of slave known as a US Citizen. Check it out. So it is that I do not claim any allegiance to any supposed “one nation under God” which more exactly is a legal fiction that claims to be god. The united States is supposed to be a federation of sovereign States or nations, a constitutional republic with a rule of law. The situation today is that the bureaucrats that call themselves government exempt themselves from what they insist is law that we the people must obey without question. I am a North American by birth and I don’t need any “government ID” to tell me so. I am a proponent of home schooling. I never learned history in the government fool system, I was required to learn evolution as though it were an established fact, and I consider my years spent in the public fool system a period of outright indoctrination in the religion of government as god. “War of Northern Aggression” — guess we know which side of Mason-Dixon you hail from. Followed by Sovereign Citizen boilerplate duckspeak.